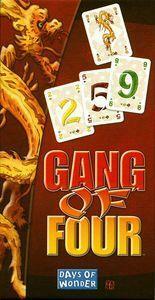 Gang of Four™ is an exciting game of Cunning, Strategy and Power. The game\'s premise is simple - be the first to rid yourself of all your cards and ascend to supreme power. But beware - a strategic misstep may find you in a struggle to survive. History. The term, Gang of Four, was first used to describe four powerful radicals in Communist China that rose to power during the Cultural Revolution (1966-1976) and dominated Chinese politics during the early 1970s. Led by Jiang Qing, a former actress and the power-hungry wife of Chairman Mao, the Gang of Four dominated political, economic and cultural life in China for years. One month after Mao\'s death, they were arrested and jailed, thus ending China\'s slide into radicalism.